SEATTLE—June 5, 2015—The University District Food Bank, which serves more than 1100 families each week out of an 800 square foot church basement, is breaking ground on its new 6000 square foot, environmentally friendly facility at 5019 Roosevelt Way Northeast in Seattle’s University District on Tuesday, June 16 at 3:30 p.m. 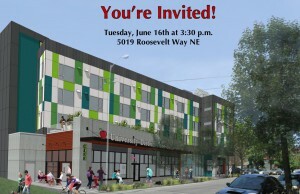 The ceremony will be held at the new site just north of the corner of 50th and Roosevelt Way. 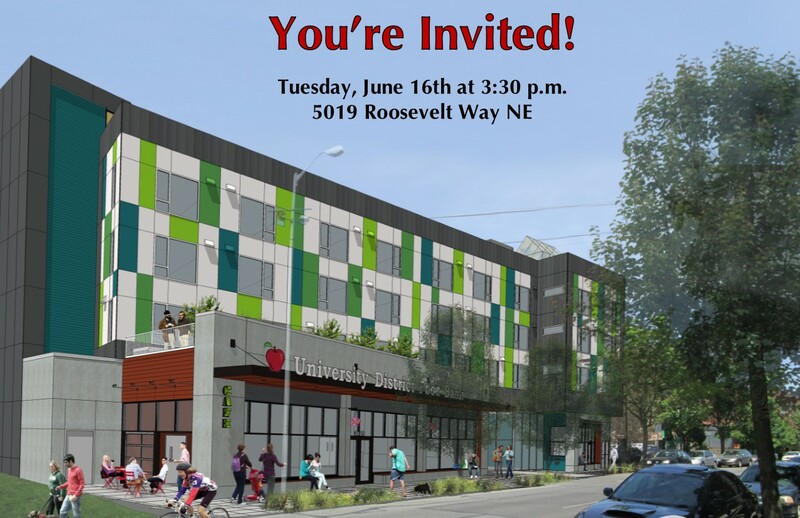 Elected officials and food bank partners Low Income Housing Institute (LIHI) and YouthCare, will be there to commemorate this special occasion for the new University Commons facility. “We’re thrilled to be breaking ground on the new University Commons and food bank facility. The support of the community has been vital to making this dream a reality and we are so thankful to all our partners,” said Joe Gruber, University District Food Bank’s Executive Director. LIHI is overseeing the construction, and will own and operate 48 units of low income housing above the food bank, 16 of which will be managed by YouthCare and reserved for young adults. All residents are expected to use the food bank. YouthCare will run its successful barista training program for at-risk youth, and partner with the food bank for job and life skills training programs. The food bank will be located on the ground floor with indoor waiting area (currently customers have to wait outside) and full ADA accessibility. In addition to a grocery-store style distribution space, the food bank runs grassroots programs that bring nutritious, healthy, age- and culturally-appropriate food to customers in need. Its home delivery program provides healthy food to 80 homebound senior citizens every week. Packs For Kids gives backpacks of food every Friday to more than 450 K-12 students per week at eight nearby schools. The food bank capital campaign, Fight Hunger Build Hope, has successfully raised seventy-five percent of its $3.6 million goal to date with support from local community groups, grants and private donations. The campaign is still aiming to raise another $900,000 by June 2016 to meet the building costs of the new facility and continue to operate with a lean staff of three full-time employees and three part-time employees once the new facility opens. Completion and move-in are planned for summer 2016. For updated capital campaign and groundbreaking information visit the University District Food Bank website and Facebook. For more than 30 years, University District Food Bank has helped prevent hunger in Northeast Seattle neighborhoods. Each week, more than 1,100 different families receive groceries and supplies to prepare nutritionally balanced meals at home as well as toiletries and baby food. UDFB distributes 2.3 million pounds of food annually, about 1.9 million meals per year, and currently serve 5,200 households (9,000 individuals) per year to people living in the 98102, 98103, 98105, 98112, 98115, and 98125. The food bank strives to provide individuals and families in need with food and access to a network of community resources that helps them achieve self-sufficiency.